The small Northumberland town of Haltwhistle, close to Hadrian's Wall, has created a tourism industry around its claim to be at the centre of Britain. But what would Scottish independence mean for the town's future? Stroll around the town and there is no doubt about where it feels its identity lies. "Welcome to Haltwhistle. 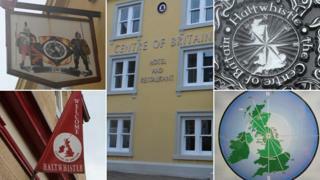 The centre of Britain" is emblazoned across bright red pennants, banners and buildings. There's a Centre of Britain launderette, a Centre of Britain gallery and a centuries old sandstone-coloured Centre of Britain Hotel. The branding is the brainchild of David Taylor, who calls himself an amateur centrographer. He says there are nine ways of measuring the centre of Britain and Haltwhistle fits seven of them. "Start with the longest north-south line with a centre on land through the British Isles, and its halfway point is Haltwhistle. From that point, every geographic opposite compass point has an equidistance from Haltwhistle - north-south, east-west, north north-east, south south-west. "The centre of all parts of the UK - the centre of England in Meriden (West Midlands), the centre of Scotland in the Forest of Atholl, the centre of Wales in Carno and the centre of Northern Ireland in Pomeroy - are also all equidistant from Haltwhistle," he says. Mr Taylor, who made his discovery and changed the name of his hotel about 20 years ago, says the label "put Haltwhistle on the map". "It draws people's attention to the place. People had never heard of us - they have now," he says. Most locals seem to agree. Christine James, owner of Intrim hairdressers, says the town is proud of the title. "It brings tourists in the same way as Land's End and John o'Groats does - we're the bit in the middle. "We're lucky to have the best-preserved bits of Hadrian's Wall which people come to from all over the world, but whether people realise it or not, it helps. People don't remember where they've been, but they remember they've been to the centre of Britain," she says. In a nearby coffee shop, Alvian Nixon, 75, agrees. "The area has always had good amount of visitors, but I think the title boosts it a bit," he says. Do you think Mr Salmond would pay us compensation? Brother Billy Nixon, 67, says it creates a talking point with neighbouring towns. "There is a bit of rivalry - Allendale a few miles away claims the same title, there's another town further up the border which does too. It depends where you take the measurements from," he says. Indeed Haltwhistle isn't the only place that boasts the centre of Britain crown. Its main rival, Dunsop Bridge, Lancashire, 71 miles (114 km) away to the south, also has some credentials. Its only monument is a payphone installed by British Telecom in 1992. A plaque reads: "You are calling from the BT payphone that marks the centre of Great Britain." However, the Ordnance Survey - which uses the "centre of gravity" method to find the point at which a cardboard cut-out of Great Britain and its 401 associated islands would theoretically balance on a pinhead - puts the centre seven kilometres north-west of the phone, at grid reference SD 64188.3 56541.43. There is no monument or sign there, just a peat bog on a farm. Taylor concedes that Dunsop Bridge, or thereabouts, is the "pencil point champion - if you can call it that - of Britain". But he maintains that the ways Haltwhistle measures up are "the most important centre of Britain criteria". But does he worry that a "Yes" vote in the Scottish referendum on 18 September - which could see Scotland become an independent country - will result in the town losing the brand he has spent so long creating? "It won't make any difference. It's not necessarily tied to a political entity, it's a geographical entity," he says. The centre of England and Wales - Britain without Scotland - would be Walmley, in the West Midlands, according to the OS. Haltwhistle Partnership volunteer David Hutton, 65, recognises the town might hit a bit of a stumbling block. "I don't think people have thought about it. But the Centre of Britain Hotel would have to change its name wouldn't it? "Would we have to relocate if Scotland goes? We'd need government money wouldn't we. Do you think Mr Salmond would pay us compensation?" he muses. Local resident Margaret Holmes, 66, says it would be a shame if Haltwhistle lost its title as the centre of Britain if Scotland votes "Yes". But Billy Nixon thinks the town wouldn't miss it if all the posters came down. "We're not just the centre of Britain, we've got an awful lot of good walking, Roman roads and Hadrian's Wall. We can still sell it - we might just have to find another gimmick," he says. People resident in Scotland will be able to take part in the vote, answering the "Yes/No" question: "Should Scotland be an independent country?"